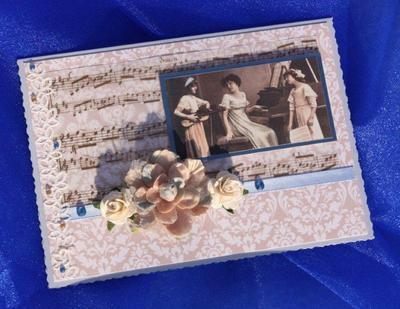 this deckle-edged pearl grey-blue 126 x 178mm card is matted with a pinky-beige nostalgic print overlaid with a gold music-printed vellum. A tinted photographic image is mounted on blue to match the blue satin ribbon which is trimmed with sumptuous cream and pinky-beige fabric roses. A paper-lace border is embellished with tiny gold and blue gems. The paper insert bears the message "Best Wishes' but this can be changed to suit your requirements. 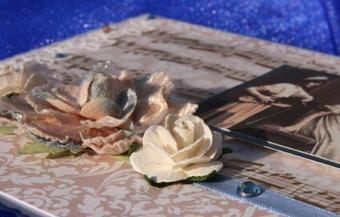 The price includes a tissue-lined box embellished with blue ribbon.